You know us for our sun, our sand and our shimmering shores. (Say that three times fast.) But did you know there’s more to entertain your family beyond our beautiful beaches? Here, we highlight our top picks for your amusement from Pensacola to Fort Walton Beach. So when you’ve had your fill of collecting seashells and building sandcastles, you’ll have no shortage of things to do. From west to east, sun up to sun down … have fun! Adventures Unlimited This outdoor wonderland offers river (think canoe, tube and paddle board) as well as zip line adventures on the Blackwater River. There’s also a nature trail, volleyball court, playground and sports field. Oops Alley This clean and bright bowling alley boasts an arcade full of the best games, plus a full-service restaurant. Sam’s Fun City Pensacola’s only amusement and waterpark features 20 rides and attractions for kids of all ages – including go carts, mini golf, water slide, laser tag and a bounce house. Fast Eddie’s Fun Center Touting itself as Pensacola No. 1 Family Fun Center Since 1989, this park has it all – games, rides, food and fun – with a 10% military discount every day. Blue Wahoos Baseball Stadium Take in a ball game during the season, or just take a stroll along the bayfront. There are also seasonal outdoor concerts, frozen yogurt, and a discovery center for the wee ones. Waterboyz It might look like a surf shop from the outside, but this store in the heart of Pensacola houses a 5,000 sq. ft. air-conditioned skate park, complete with a snack bar and ample couch space for you to watch your kids do their thing. Gulf Breeze FunPlex Tumbling and gymnastics for all ages, with special camps and classes featuring trampolines, balance beams, vaults and more! The Gulf Breeze Zoo Get up close and personal with animals, ride the Safari Train and attend special family events. Tiki Island Golf and Games This miniature golf facility features a snack bar and arcade games right on the Gulf of Mexico. When you finish your 18 holes, take a walk along the beach. Gulfarium Marine Adventure Park Get to know the creatures of the deep at this park dedicated to preservation. Here, you can view, feed or swim with your favorite sea life – with shows and camps for the whole family! Goofy Golf Operating since 1958, this miniature golf park features two courses, and is home to “Hammy” the T-Rex, a family favorite for more than 50 years. Okaloosa Island Boardwalk Dining, shopping and entertainment abound at this Gulfside boardwalk, featuring a children’s playground and sand volleyball court. Ft. Walton Skating Center Enjoy an old family pastime at this skating center, which hosts special events and parties year round. Big Kahuna’s Water & Adventure Park Slip and slide your way through this enormous waterpark, which also features go-karts, mini golf and more thrills for your family. The Track Play in the arcade, hop in the bumper boats, race go-karts and more at this family fun center in the heart of Destin. Fudpucker’s & Fat Daddy’s Arcade Eat and play at Fudpucker’s, where you can also catch a live gator show or have your photo taken with a baby alligator. They also have water sports rentals and fishing charters right out back. 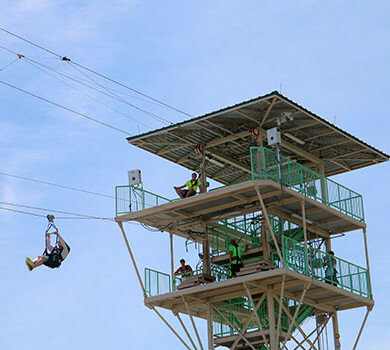 HarborWalk Village Head to this waterfront complex for family fun including magic dancing, laser maze, zip line, and free fall.